Ventotene is a small island off the western coast of Italy, between Rome and Naples. 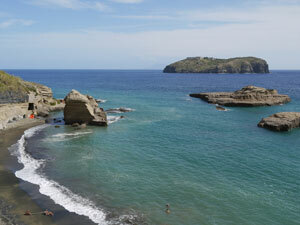 It is one of the Pontine islands (Isole Pontine), an archipelago visited more by Italians than foreign tourists. Although it is reached by regular scheduled ferries, Ventotene has a remote feel and a real island character. It is an excellent place to get away from it all and spend a few peaceful days, particularly during the shoulder seasons on either side of the Italian summer holidays. The island's highlights include Roman ruins and an excursion to the neighbouring island of Santo Stefano, a former prison. Ventotene is a small island rising like a slanting reef out of the Tyrrhenian sea. The island is thin and less than two miles long, steep and rocky on one side and sloping towards the sea on the other. Rocky, and with no water springs, it was an unpromising place until the ingenious Romans turned up and set to work. With a combination of skilled engineering and slave labour, they dug a harbour out of the island's tufa rock and created a network of rock-cut water cisterns to save rainwater and channel it around the island. A luxurious imperial villa was built on a panoramic headland, and the island, then known as Pandataria, served as an agricultural estate attached to the villa. The grand palace was, however, not destined to be enjoyed by emperors, but used as a place of exile for high-status prisoners. The first was Augustus's daughter Julia, who was sent here on charges, perhaps false, of treason and adultery. The ruined villa is now known as the Villa Giulia, after its most famous resident, although other prisoners were to follow her. Villa Giulia covers the headland of Punta Eolo with an unprepossessing confused mass of low ruined walls. With a guided tour, though, the visitor begins to spot traces of its past glory - fragments of mosaic, painted walls, ruined baths. The other significant Roman remains on Ventotene are its cisterns, whose underground chambers have been used and re-used over the centuries for a range of purposes. Like the villa and Santo Stefano (described below) they can only be visited, at the time of writing, on organised guided tours. Run from the island's archaeological museum, the tours alternate throughout the week; times and days are publicised locally. To be sure of seeing a range of sights, it is best to plan a stay of two or more days. The archaeological museum (Museo Storico Archeologico) is housed in the basement of Ventotene's imposing town hall, the Torre Borbonico, an old Bourbon fortress which dominates the town square. It contains a good collection of artefacts from local shipwrecks and from the Roman villa. Many of the finest sculptures and marbles were removed from the island in later centuries, but the fragments in this museum, including painted stucco decorations, give an idea of the high standard of decor. Other exhibits include a bust of Tiberius (Julia's husband) found in the harbour. Opening times are limited, so visitors should confirm the latest hours on arrival at Ventotene. Ventotene's old Roman port is still in use today. It has been altered over the millennia and the rock chambers cut to store Roman goods are now used by fishermen and diving businesses. Fishing boats and excursion boats use the harbour, and from the quayside you can hire boats or book island tours and trips to Santo Stefano. Visitors can also book diving lessons and excursions with Ciro Sub and Ventotene Diving Academy. Around a corner from the Roman harbour is Ventotene's modern port, a functional and unromantic place where the island ferries dock. Ventotene has one settlement, above the old port. It can be reached on foot from water level by climbing a theatrical yellow-painted zig-zag lane from the Roman port. A curving tarmac road offers a less steep route, winding around another picturesque inlet. The town clusters around the large square Piazza Castello. A selection of the island's services - a couple of food shops, a fabulous bakery and a couple of bar-restaurants - are on this square and the road alongside. Other buildings are strung out along Via Olivi, a road which runs the length of the island. There isn't much traffic on Ventotene, and the narrow Via Olivi offers a pleasant stroll along the island. You may catch glimpses of migratory birds, such as hoopoes. Ventotene's second museum, the Museo della Migrazione, is situated towards the far end of the island and is dedicated to the birds which visit the island. It also has a panoramic terrace from which you can enjoy sea views. Via Parata Grande, off Via Olivi, leads to a viewpoint above the cove of Parata Grande, where a path climbs down to sea level. You can see more of the island's coastline, or visit small rocky coves, by booking a boat trip around the island. Although Ventotene is mostly rocky, there is a very pleasant beach below the town, in a bay called Cala Nave around a headland from the harbour. Excitingly, a tunnel runs through the headland to link the beach with the port. Smooth rock platforms by the headland offer more opportunities for sunbathing and swimming. Around the foot of the lighthouse, you can spot part of a Roman system of fisheries cut into the rock. Between the lighthouse and the Torre Borbonico is a pleasant park which encloses the ruins of another Roman villa, with low ruined walls, an archway and more scraps of mosaic. This villa, above the fishery, was built on several levels and part of the lower level now stands on a rock stack out to sea; erosion and quarrying have detached this section from the other surviving remains of the villa. The island of Santo Stefano, around a mile from Ventotene, makes an interesting excursion from Ventotene. Boat tours from the Roman port may take you around the island and possibly visit the Vasca Giulia, a Roman-era rock-cut basin by the sea. At the time of writing, though, landing on the island is forbidden - unless you visit with a guided tour of the abandoned prison. Boatmen at the Roman port ferry the visitors across from Ventotene to Santo Stefano, where a guide leads the group up steep steps to the prison which dominates the island. This prison, the Carcere Borbonico, is a monument falling into sad disrepair. Guided tours are in Italian and last around three hours, with lengthy talks on the history and development of the prison. Among the political prisoners incarcerated here by Italy's Fascist regime was Sandro Pertini, who later became president of Italy. Staying a few days on Ventotene allows time for relaxation, boat trips and swimming - sea and season permitting - as well as visiting all the ruins and adjusting to an island pace of life. If you are really keen on island life and looking for peace, Ventotene would make a good off-the-beaten-track retreat for a longer stay. For visitors in a hurry, a one-night-stay on the island gives you the chance to see most of the sights and appreciate the island. There are a handful of bar-restaurants on Ventotene, around the port area and on Piazza Castello; the choice becomes very limited out of season. 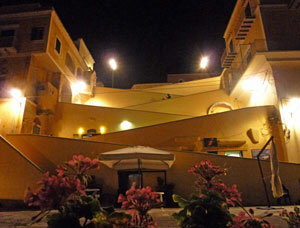 In the piazza Da Verde functions as a cafe-bar and also a restaurant with pizza and seafood menus. As well as locally-caught fish, one of Ventotene's specialities is zuppa di lenticchie, lentil soup made from lentils grown on the island. A bakery called Il Forno on Via Olivi serves a wide range of bread, pastries and pizza slices, and is a great option for a cheap lunch. There is a cashpoint in Piazza Castello, a couple of general stores and a post office nearby and a few souvenir-type shops on the lane down towards the harbour. There is a pharmacy near the church. The biggest event of the year on Ventotene is the festival of the island patron saint, Santa Candida, on 20th September. Several days of processions and celebrations culminate in a big firework display and candle-lit balloons are released. Note that ferry schedules can change at this time to accommodate additional visitors to Ventotene. An information point can be found at the foot of the zig-zag harbour ramp. Posters with details of guided tours and opening times can be seen here and around town, with further information available from the museum during its opening hours. Since Ventotene is a small and close-knit community, you will find that locals and hotel staff will generally know what is going on as well as the latest ferry times. Ventotene can be reached from the Italian mainland and - depending on the ferry timetables - from Ponza. On the mainland, the main port for the islands is Formia (approximately two hours by ferry, one hour by catamaran), with seasonal connections from Naples and other ports. In the summer there are also occasional ferries connecting Ventotene with the island of Ischia. Tickets can be bought at a kiosk by the port in Ventotene. Boat trips can be booked and small boats hired down at the Roman port. 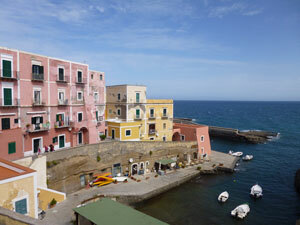 The town of Ventotene is small (little more than a village) and is easy to explore on foot. Hotels, especially those which are situated further along the island, generally offer lifts to guests arriving at the port, so contact your accommodation with your arrival details before you travel. Walking from the port to the town, along the waterfront road through the Roman port and then ascending either the zig-zag pedestrian route or following the curving road, is not arduous, and is manageable with a wheeled suitcase. You might be interested also on this amazing places.